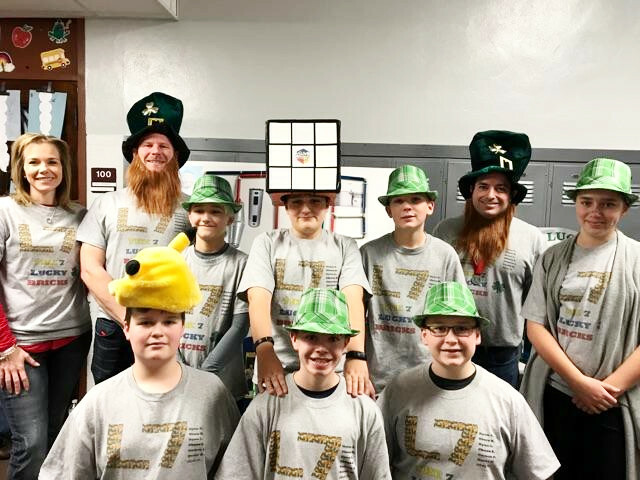 Congratulations to "The 7 Lucky Bricks!” They are one of Waynesville’s first Lego Robotics teams moving on to the First Lego League district competition on January 6th and 7th at Wright State University. Ryan Eshler, Clara Kolaczkowski, Ryan Leopold, Carson Shutts, Chase Skidmore, David Weaver and Nick Williamson. The team competed at a local competition against 11 other teams on Saturday, December 10 and placed 3rd on the robot tables. They earned a 1st place trophy for robot design and are moving forward to compete at the district level on January 6th and 7th at Wright State University. This group of 7th grade students have worked very hard over the last several months building and programming a robot, planning out a strategy on the robot table and at the same time learning and practicing core values. They also had to come up with an innovative solution to a problem in the water cycle and complete and present a project about their solution. Their hard work has paid off and they get to compete at the district level. We wish them luck at WSU! If they do well at the district level they can move on to the state competition in February. Again congratulations and good luck! !